Hello Ladies, Here is my new post about long fabulous frock designs for women by Zahra Ahmad. Long frocks are expected to be in trend for the year 2017 as many designers are designing long frock collections so this frock trend is going to be in fashion this year. Zahra Ahmad is one of the most famous designers in Pakistan as she is designing clothes from high to normal price range. She is presenting long frocks with the fusion of Pakistani, Indian and Western cuts that make her designs unique. Zahra’ s latest frock collection consists of different unique designs with hues that are perfect for parties, weddings, and any special occasion. Hues used in the collection are fabulous for to look stunning at any event. Here are the latest long frock styles to get an idea or buy a perfect dress for you. 1. A floral length flared frock in double tone with stonework on the neckline is an elegant choice for a wedding or formal party. 2. A long double tone frock in gown style with and stonework and intricate lace make this dress gorgeous for a wedding or formal party. 3. Andrakha style white frock with different lace panels makes this dress chic for semi-formal event. 4. Long floral dress in overcoat style is good to look stunning in any event. 5. Deep blue long frock with intricate embroidery pattern on neckline and contrast panel on hemline is again perfect to make a statement in any formal event. 6. Long dress with a laced overcoat is the right option for any special occasion. 7. 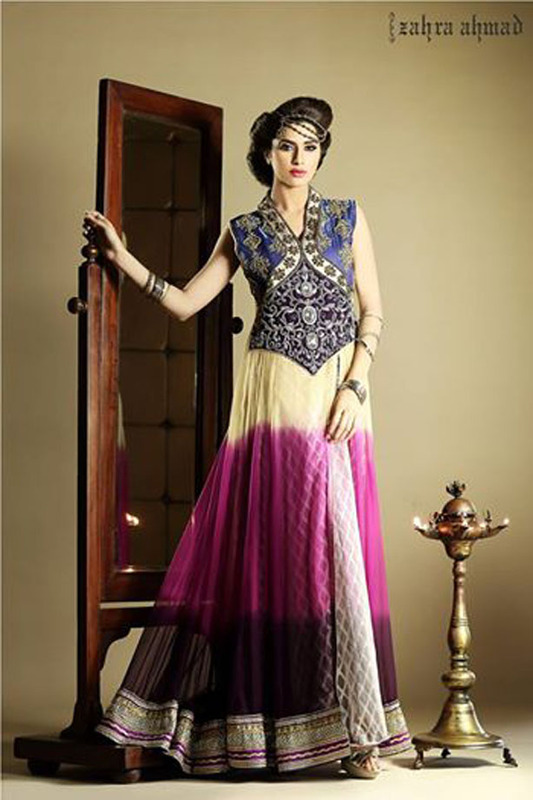 Frock style with uneven hemline and embroidery on the neckline is best for any festive event. 8. Frock design with a black net overcoat to attend any party.